Regulatory drivers and technological improvements have spurred the innovative application of dissolved gas flotation (DGF) technology in the industrial wastewater market. The technology relies on contacting wastewater with a sidestream saturated with gas—traditionally air or nitrogen—at high pressure. As the sidestream is released into an atmospheric reactor, the gas comes out of solution and forms microbubbles. The bubbles attach to solids and oil droplets, increasing their effective buoyancy and floating them to the surface of the DGF reactor. 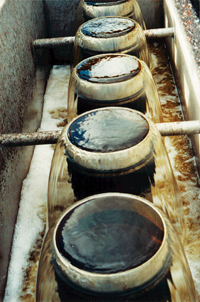 The concentrated pollutants are collected from the water surface for processing and/or disposal. During the past century, DGF primarily has been used to separate oil and suspended solids from wastewater; the use of the technology to remove biological solids, metals and nutrients, however, has grown in the past decade. DGF, conventional gravity clarification (CGC), filtration and sorption are conventional technologies used to concentrate pollutants from wastewater. The technologies rely on at least one of the following pollutant attributes: size, charge and density. Successful application of each technology is dependent on the pollutant characteristics and the strengths and weaknesses of each technology. 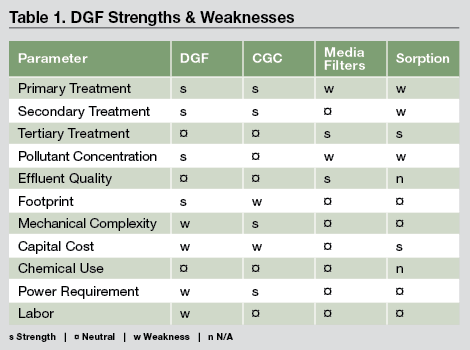 As indicated in Table 1 (see PDF version of this article), DGF has strengths in several areas related to process flexibility and footprint. This article presents five case studies illustrating the versatility of DGF technology in the industrial wastewater market. DGF is being used for the clarification of biological solids originating from aerobic activated sludge and moving-bed biological reactor processes. 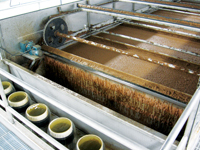 The primary advantages over CGCs include: capability to process high mixed liquor suspended solids (MLSS) concentrations—up to 10,000 mg/L—and to remove bulking solids attributed to filamentous bacterial growth, common in many industrial applications. In addition, DGF technology simultaneously thickens biological sludge (2% to 4% total solids [TS]), which reduces the volume being wasted or returned to the biological process. Table 2 (see PDF version of this article) summarizes the performance of an activated sludge process followed by DGF clarification in the snack food industry. 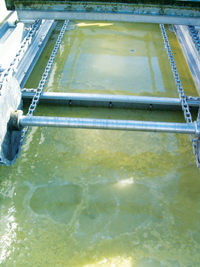 The DGF clarifier system used a high-charge cationic polymer to flocculate the biological solids (4,500 mg/L MLSS) prior to flotation. The DGF produced a high-quality effluent and concentrated sludge. Upflow anaerobic sludge blanket digesters (UASBDs) and lagoons produce solids that are difficult to remove because of poor granulation and bulking. Air and nitrogen flotation can be employed to capture these solids effectively to improve effluent quality and, in the case of an anaerobic lagoon or anaerobic contact process, return them back to the process to enhance treatment. A covered DGF was installed at a beverage plant to provide clarification of poorly granulated biological solids originating from a UASBD. As indicated in Table 3 (see PDF version of this article), total suspended solids (TSS) removal was quite high (82%), along with a high level of COD removal (67%) and phosphorous removal (84% Ortho-P) using a metal salt-based coagulant and flocculant prior to flotation. The process also thickened the biological solids to 8% TS, significantly reducing sludge hauling costs. DGF increasingly is being used to remove metals from industrial wastewater. Dissolved metals commonly are precipitated with pH adjustment and/or the addition of coagulants. These metal precipitates can be flocculated with polymer to increase DGF removal efficiency. Table 4 (see PDF version of this article) summarizes the removal of metals from acid mine drainage (AMD) using a DGF prior to discharge to a National Pollutant Discharge Elimination System (NPDES) outfall. The pH of the AMD was increased to precipitate metals prior to flotation, resulting in iron, manganese and aluminum removals greater than 86%. Algae control has been a vexing problem in industrial ponds and lagoons. In many cases, effluent suspended solids limits are exceeded when algae blooms occur and cannot be controlled with biocides. Algae solids are very amenable to removal by flocculation followed by DGF. This technology, therefore, is applicable not only to wastewater treatment but also algae carbon sequestration and biofuels processes. DGF has proven effective at removing algae, as illustrated in Table 5 (see PDF version of this article). The DGF was installed downstream of a lagoon and before an NPDES outfall. The effluent quality from the system (10 mg/L biochemical oxygen demand and 24 mg/L TSS) allows the discharger to meet its state discharge permit limits consistently. As stricter nutrient limits are imposed across the country, the need for phosphorous removal is becoming more important to industrial facilities. Phosphorous can be precipitated with metal salts and removed in a DGF. Recently, a DGF system was installed downstream of a biological treatment system with CGCs at a poultry processing plant to provide total phosphorous (TP) removal. Using aluminum chloride as a coagulant with a cationic flocculant, the DGF provides 90% TP removal with an effluent TP averaging 0.7 mg/L. Using the DGF system downstream of the CGCs reduced coagulant dosage and sludge volume. Brian Foy, P.E., is associate for Burns & McDonnell Eng. Co. Foy can be reached at [email protected]. Dr. Enos L. Stover, P.E., is president of The Stover Group. Stover can be reached at [email protected]. Charles C. Ross, P.E., is director of engineering for Environmental Treatment Systems. Ross can be reached at [email protected]. G. Edward Valentine is president of Environmental Treatment Systems. Valentine can be reached at [email protected].